The Amazon Appstore application for Android has been updated to version 2.3 today, bringing along a few handy improvements. 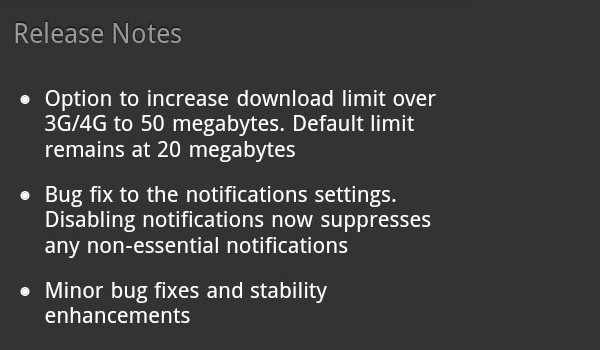 The version release notes tell us that users will have added flexibility for downloads over 3G and 4G networks, letting us set the maximum at 50MB before forcing us to Wi-Fi. Additionally, a bug fix lets users suppress non-essential notifications, keeping us from getting those goofy “update available” messages. If you’re new to Android and want another option for downloading apps and games, the Amazon Appstore is one we’d recommend. Offering up a free paid app once per day, it’s also a good source for new and exclusive titles.